Homepage. This page: A selection of pre-war bicycle sidecars, perfect for a 1920's or 1930's machine. Cycle sidecars of the 1920s & 1930s. Old bicycles are fine things indeed, but at times their luggage carrying capacity, or rather lack of it, can be an issue. Strapping things to handlebars can lead to undesirable effects upon the steering, and no ride out is improved by dropping one's machine ahead of an omnibus or trolleybus. Luggage racks are fine for a loaf of bread, or a carton of Omo washing powder, but what if weightier or bulkier objects are to be transported? This is where the bicycle sidecar comes into its own, especially for cyclists who have no intention of upgrading to a motorcycle combination, or one of the smokey, new-fangled, motor cars that seem to be proving quite popular. 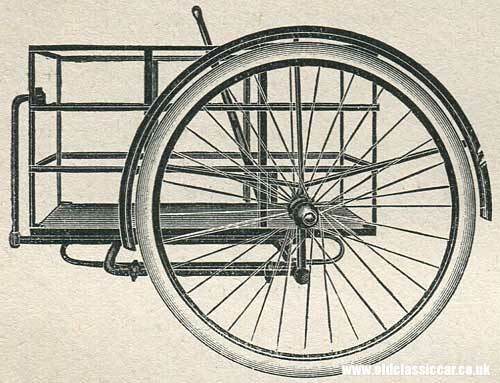 Featured on this page of the site, in the vintage and classic bicycles section, are several of the sidecars that were available to buy in the 1930s. Some were designed with tradespeople in mind, while one in particular is designed for carrying one's offspring (singular). Cyclists are fit and healthy types in the main, so the added weight of a loaded sidecar is rarely an issue, unless particularly hilly routes, or un-made carriageways and lanes, feature in the journey. 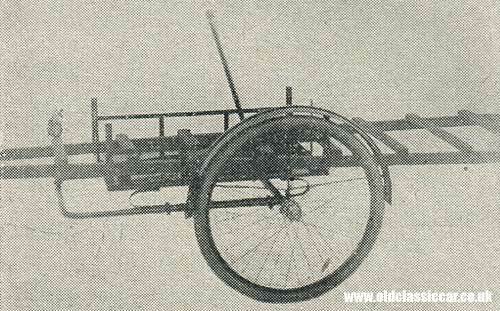 Vindec Side Cars For Pedal Cycles. 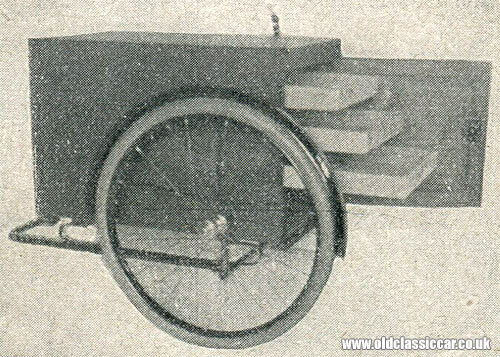 Tradesman's underslung box delivery side car. 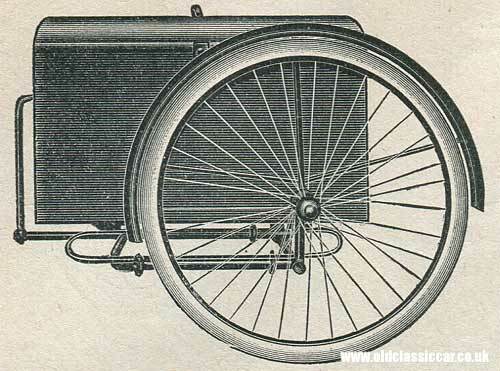 This version was equipped with either a 26" or 28" wheel, and was designed to carry a load of upto 112lb. It came with the mudguard as standard, but not the tyre. The complete sidecar cost £5 10s 0d, or was available as a chassis only, for £3 18s 0d. This would have been ideal for local light deliveries, perhaps for a youth delivering goods from a corner shop. Underslung milkman delivery side car. 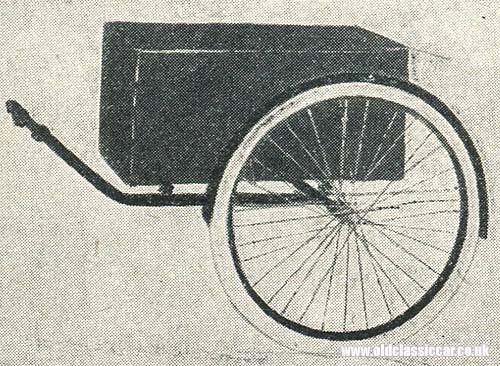 If the horse and cart was out of action for whatever reason, then Mr Grimsdale may well have dispatched Pitkin on a bicycle fitted with a sidecar such as this. Again two sizes of wheel were offered, with prices identical to those of the tradesman's version above (ie £5 10s 0d or £3 18s 0d). Is the vertical lever a parking brake? Sadly not a very clear picture, but good enough to make out the main details of this window cleaner's side car. Two wheel sizes were offered here too, but this version - with its extended ladder rack - could carry a cargo of 150lbs. Where do you hang the bucket? The cost of this version was £4 10s 0d (complete) or £3 12s 0d (chassis only). The catalogue suggests that this underslung type, with its fitted drawers, was perfect for grocers, confectioners and other similar businesses needing to deliver small items in their locality. 120lb was the weight limit - ample for a hearty supply of gobstoppers, aniseed balls and penny chews. The complete unit, minus tyre as usual, retailed at £5 10s 0d, although an extra 4s 0d was charged for each tray required. As the name suggests, this machine was designed with delivering small-medium parcels in mind (up to a maximum of 56lb in weight). Cost? £3 15s 0d. Rather than strap one's offspring to a luggage rack, an outlay of £3 15s 0d could provide young 'erbert or 'ilda with a semi-confortable means of travelling around with his or her parent. 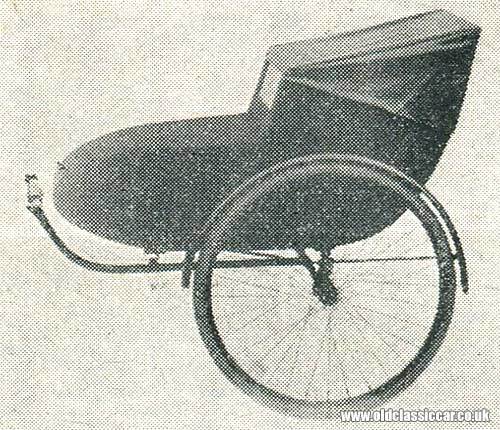 The model shown is the Vindec Juvenile Side Car No.1, which came with a folding hood, a tiny screen, and a padded seat. It was designed for children up to the age of 9 years. Although not illustrated, a second type was also listed - the No.20. This had a lightweight black body, enhanced with a white line. It too had a hood, and, apparently, "walnut" - a decorative finish perhaps? I doubt it refers to picnic tables. It had front and side wheels, plus transparent panels the catalogue says. Click here to return to the classic and vintage bicycle section of the site. On a related note, a selection of ancient photographs all featuring motorcycle and sidecar combinations, may be found on this page of the site.